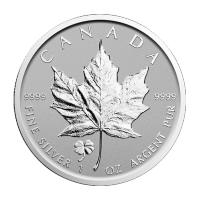 1盎司2016加拿大枫叶四叶苜蓿密印反精制银币 The four leaf clover is a traditional symbol of good luck, found here on a limited mintage reverse proof silver maple leaf! These coins are minted in a beautiful reverse proof style, with the field being frosted while the maple leaf, privy mark and lettering are shiny. This release will be limited to mintage of only 50000. Each leaf of the four leaf clover represents a different characteristic: the first is for faith, the second is for hope, the third is for love, and the fourth is for luck. These coins will always be in demand thanks to their limited mintage, and will prove to be a highly liquid inflation hedge. Grab yourself a little luck o' the Irish before these are sold out!